There are some industrial application where we require that at certain HMI Screen a particular BIT should be ON. 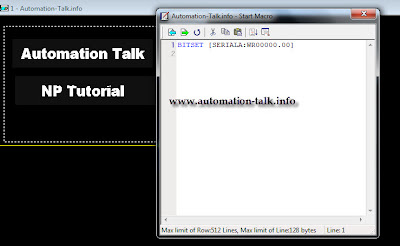 This can be done by writing a PLC program or simply by use of Macro in Omron HMI's like NP, NT, NS etc. Earlier we told you how to use macro in your HMI program and now this tutorial will tell you how to use macro to simplify your PLC programming work. Subscribe to Automation-Talk by Email. 1. You will have to go to MACRO as told about Using a Macro in NP designer. 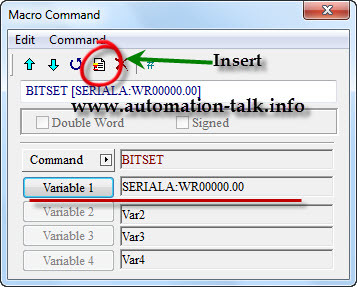 2.Now when you are in Macro Command window,just click on command to see all list of command and select BIT Setting and then BIT SET. 3.Now choose your Variable which can be a CIO, Work bit, Holding bit etc. and after that click on insert to put that in Macro window. Here we have used Work bit (WR). 4. Now as the macro command is inserted, you can see it in Macro window. You can write other macro command also for that screen. Every screen has start and end micro so you can similarly program for end macro also. Suppose you want to clear the set bit and the exit of the screen, then just use bit clear instruction at end macro.